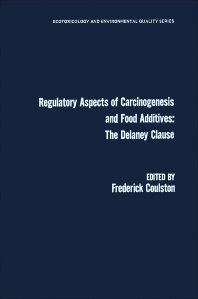 Regulatory Aspects of Carcinogenesis and Food Additives: The Delaney Clause is composed of papers and discussions presented in the seventh meeting of the International Academy of Environmental Safety regarding the philosophy of the Delaney Clause. The Delaney Clause became a part of the Food and Drug Law in 1958. It states in part “that no additive shall be deemed to be safe if it is found to induce cancer when ingested by man or animal, or if it is found after tests which are appropriate for evaluation of safety of food additives to induce cancer in man or animal”. This book covers the different views of the meeting’s participants on the interpretation of the Delaney Clause. It presents list of points that should be considered in making decisions with respect to safety. Many other factors that should be taken into consideration are also discussed in this reference.